There’s plenty of things you can add to your pregnancy bucket list. However, if your baby brain is struggling to come up with ideas, below you’ll discover some of the top things to do before you give birth. Technically, you can still go to the movies when baby arrives. However, it’s not quite as easy, or as relaxing, to watch a movie with baby in tow! Not only do you have what feels like a million extra things to pack to take with you, but there’s also the worry baby will cry and kick up a fuss while you’re there. For this reason, many parents prefer to wait until their kids are a little older before they take them to the movies for the first time. So, before your little bundle of joy arrives, make a movie date with yourself, your partner or with friends. The last thing you’re going to feel when you’ve had your baby is classy! Your days will largely be spent cleaning all kinds of bodily fluids up. You’ll become accustomed to walking around with spit-up all over your clothes, in your hair and even in places you wouldn’t have ever dreamed of finding it! So, you might as well make the most of this baby-free time and arrange to go to a classy event. Get dressed up, pamper yourself and enjoy a more elegant night out. If there aren’t any suitable events, why not host your own glamour party? You and your friends can still get dressed up, eat fancy food and just enjoy an adult-themed evening. It’s important to get lots of rest when you’re pregnant. So, why not follow doctor’s orders and enjoy a bed day? Have a nice sleep in, laze around in your PJ’s and binge-watch your favorite shows on Netflix. If you find yourself starting to feel a little bored, remind yourself you aren’t going to be getting any lazy days once baby arrives! Another thing that’s going to prove difficult to do when baby arrives is dine out. Of course, parents dine out with their babies all the time, but that isn’t to say it’s always a pleasant experience. In fact, it can be extremely stressful taking baby out to a restaurant. So, make the most of your baby-free time and dine out as much as you possibly can. Once baby is here, your dining out experience is going to be very different to what it is now. Once baby is here, you’re going to be left with very little time for yourself. You especially won’t have the luxury of being able to pop to the hairdressers for a quick trim. So, now’s the perfect time to treat yourself to a haircut. Consider having the hair cut short too. One thing many pregnant women aren’t prepared for, is the hair loss that can follow after the birth. It’s all down to hormones. When you are pregnant, your hair temporarily stops shedding due to increased estrogen. This is why many pregnant women claim their hair looks healthier now than it ever has done. However, fast forward to after the birth and those estrogen levels drop, causing the hair to start shedding once again. As it hasn’t shed for a while, you’ll notice it can start to fall out in clumps. It’s only temporary but it can understandably be terrifying to see. If you have longer hair, it will appear visibly dull and thinner. You may even start to see small bald patches appearing. Having the hair cut short will hide the temporary hair loss, leaving you feeling much more confident. Of course, shorter hair is also easier to mange and quicker to wash – something you’ll be glad of when you’re trying to care for a new baby. Like everything else, hanging out with friends after baby is born is going to prove difficult. You’ll still be able to organize the odd day or evening to catch up, but it’s not as simple as it is right now. So, make the time to spend with friends now, especially those who don’t currently have children. That way, you won’t feel as guilty once baby does arrive, if you can’t hang out with them for a while. You may not feel particularly beautiful, especially if you’re in the third trimester of pregnancy. However, taking the time to just dress up nice can help you to feel a little better. There’s plenty of stylish and beautiful maternity clothes available these days so splash out a little and treat yourself. 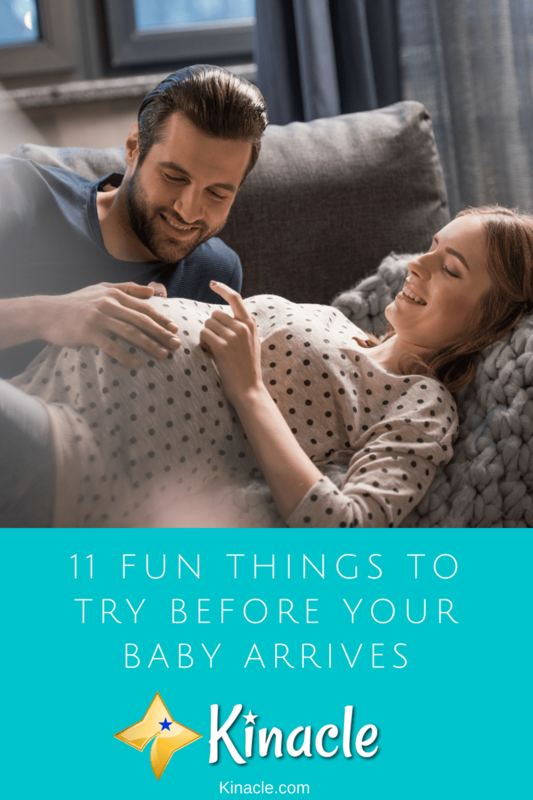 You’re going to have few opportunities to dress up nice when baby is here, so it’s a good idea to take full advantage while they’re still safely snuggled up in your tummy. Who knows when your next vacation will be when baby arrives. If there’s somewhere you’ve always wanted to go, why not head off on a little vacation and enjoy your childfree time. You don’t need to head off on a long-haul trip, even a local holiday can prove relaxing and enjoyable. However, if you can afford to jet off on a long-haul vacation, it’s definitely worth considering. You may be able to organize taking baby on a short vacation but taking them on a long-haul flight isn’t exactly fun! Similarly, your chance to go on a road trip when baby comes along is going to be lost. No baby is going to happily spend hours in a car. Road trips can be super-fun and a great way to enjoy your last weeks or months of child freedom. The US is packed full of great places to take a road trip. So, get planning and enjoy one last adventure before you become a parent. While you can technically get everything you need online these days, why not actually head out to the stores and enjoy a little retail therapy? Going shopping with a baby is stressful and you need to carry a huge supply of essentials. So, you’ll spend a lot of time online shopping when they arrive. This means now is the perfect time to actually enjoy going out to the store. You don’t even need to necessarily buy anything. Just the act of getting out and leisurely walking around is going to be a treat in itself. But of course, taking some leisure time and browsing for stuff online can be relaxing as well. Why not hop on over to our store and see what we have to offer? Finally, one thing you’ll definitely want to do while you’re waiting for baby to arrive, is spend as much time with yourself as possible. You aren’t going to get hardly any time to yourself once you become a parent. So, organize a few dates with yourself. Do things you really enjoy and pamper yourself as much as possible. This will also leave you feeling much more relaxed once baby does arrive. So, there you have it – some of the top things to do before you give birth. At the moment, there’s so many things you likely take for granted. However, that will soon change once baby does come along!